Finally, at long last, I went in to see what all the fuss was about. 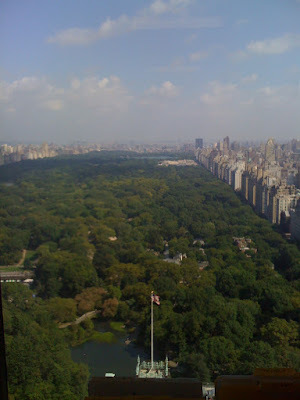 My husband began a new job on the 35th floor and a new view overlooking Central Park in Manhattan. It really is like something out of a movie. He reminds me of the view of his first apartment that overlooked a courtyard that resembled a prison with the circular wire. But of course, we all know that to achieve a view like this means tons of hard work to arrive on the top with a vista like this. I would feel "on top" of the world with this view. How about you? What a beauty this bathroom is, designed by Sandra Morgan Interiors, a slipper chair, a fire and a tub for a nice relaxing soak. I think at the end of the day, there is nothing more relaxing than soaking in a tub with a good read. I myself love baths, but I must admit, that I need a shower to really wake up properly in the early morning. So - tell me, do you prefer showers or baths? Fine Art Photographer Elizabeth Belliveau and Artist, Patricia van Essche "pve"
One of the most wonderful things about friendships is seeing what's next. A career in fashion was the perfect place to meld a love of art and design as well as inspiration to always look ahead for a fashionable life. After all, friends and family prove to be an incredible source of strength and constancy in a world that is always looking for the next new collection. Last week, I had the great pleasure of being in wonderful company of my dear friend Elizabeth. We met whilst working in Fashion and our career paths crossed twice, now, make that three times. After our life in fashion, we both chose to raise our families while never straying far from our love of design and the creativity that we honored in each other. We have provided each other with enthusiasm and encouragement and validity. I always admire Elizabeth's dedication to her work as well as her family. Our desire to be there for our families, yet long for a creative outlet as well as rewards has been a common thread of our friendship. She is the photographer who snapped the amazing shot of me in the upper right hand corner, (that so many of you comment on, time and again.) My artwork and her fine art photo images are on view at Sandra Morgan Interiors. 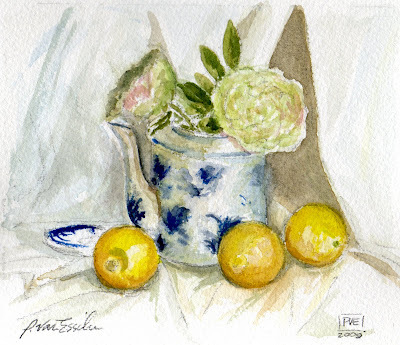 Please take a moment to view Elizabeth's wonderful site and leave her a comment here to inspire her to start her very own blog! I will make sure that all your comments are sent to her. My fashion day friends are like that, supportive, encouraging as well as thoughtful. Do you have friends who have provided support and motivation along your quest? 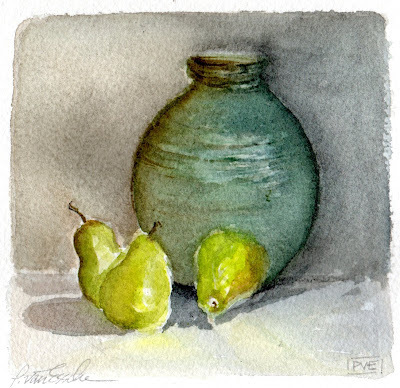 Make Lemonade, pve design artwork, sold. I made time to go to my painting class and painted these pretty things. I love taking time for pretty little things. I also love fine lines, but sometimes feel the need to step out of my box. pve design, water-colour, small work of art, sold. This was my first attempt, then I went back to my fine lines. Which one do you prefer, with the fine lines or without? Thanks to each of you who took the time to look carefully and to leave me a comment, both works of art have been sold and I am so thrilled to know that my work will be loved as much as I love painting. Thank-you! Happy Anniversary to my husband today! Yes, this fabulous cymbidium blossom looks "for real"~ however it requires no care and will last forever. Today, I shall be celebrating twenty-two years of marriage! I think back to our rehearsal dinner. 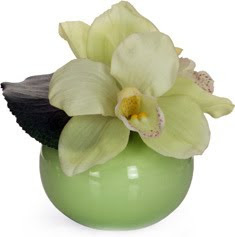 A simple centerpiece of an orchid floating inside small clear bowls on top of circular mirrors graced the tables. Everyone loved the simplicity. If only I had known about her and her ingenious and glorious twin daughters then, I would have had the option of a "faux fleurs!" Faux means no maintenance which is easy to love. 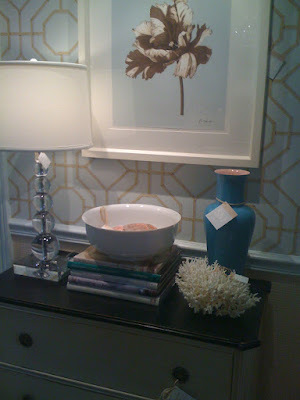 Do you have any faux flowers in your home or are you all about keeping it real? 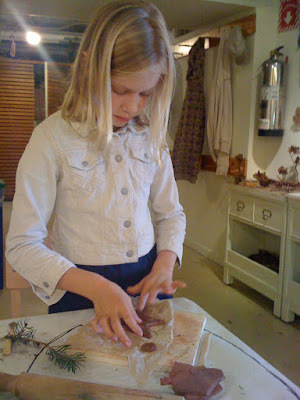 Look at these little hands of my daughter, lost in crafting at Wave Hill. She knew right away she wanted to make a "star" to hang on our tree. She knew she wanted to wear her corduroy jacket from several seasons ago, with her name that I embroidered on the back. ( No matter that it is a tad bit snug and the sleeves are now a fashionable 3/4 length.) This is a gal who knows exactly what she wants. Look at that fierce determination and concentration. That is what I love about art. I feel a certain focus when I create. There were pine-cones and bits of nature to add to the project. Even though she knew it was a glorious day outside, she still wanted to get lost in crafting. 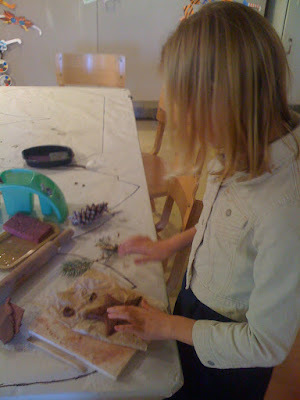 On the way home, she asked for more clay so she could make something at home. 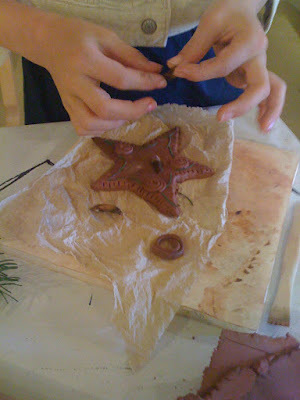 She has already been one busy and very bright star with the clay her father bought her. With a busy and exciting week behind me, I wanted to let my family know just how much they mean to me. I am full of gratitude for your patience and support when I spread myself too thin and get lost in my artwork. Thank-you to my dear husband for braving the Back-to-School nights (2) this week and paltry dinners as I was a bit lost in my work. Thanks to each of you for coming out to support me at 2 venues this week. It sure feels good to have a little praise, and then to come home to such bright stars! pve design, the sandra morgan shop cleverly framed on top of a fun wallpaper! 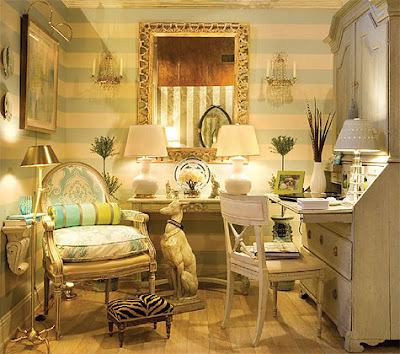 Sandra Morgan Interiors, a shop full of inspiration for the home. Plus my dear friend Elizabeth will be there too showing her stunning fine art photography. 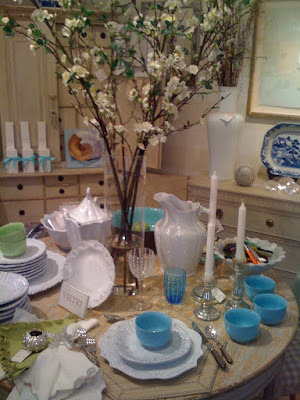 Lovely table-scapes, touches of blue, little things to delight one's home. Lamps, bowls, objects, art, furnishings on display to bring home. 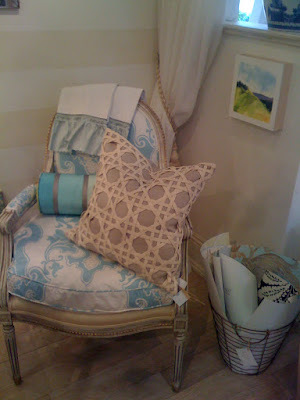 Chairs, pillows, artwork, ceramics, accessories to liven up your home. 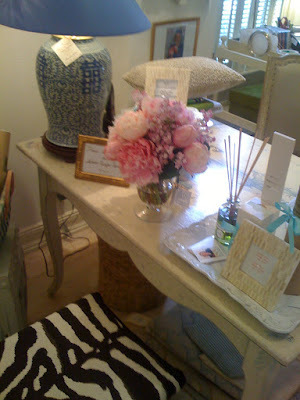 Tonight I will be at the Sandra Morgan Shop in Greenwich for the at home event 6 to 9. Love it if you can make time to stop in. Sandra will be representing my work and I will be there sketching live. I would love to come home to this, tucked in an entry. No need to walk, nor feed, just admire this elegant and handsome sculpture. He reminds me of Monty. 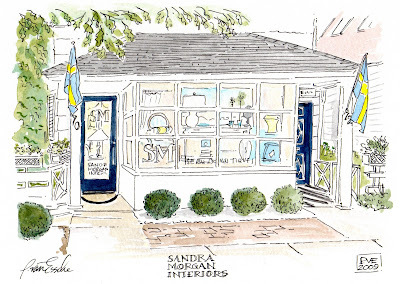 Sandra's shop is all about designing and creating an artful life. Inspiration aplenty! I am thrilled to be apart of such a unique shop. Stop in and see my artwork. There will be lots of exciting things to see. 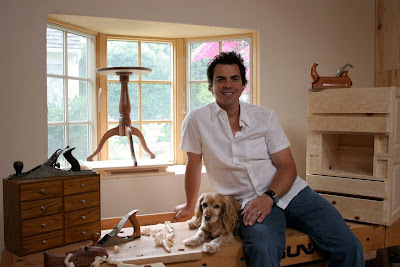 Meet Chris Holme and his lovely shop dog "Taffy." 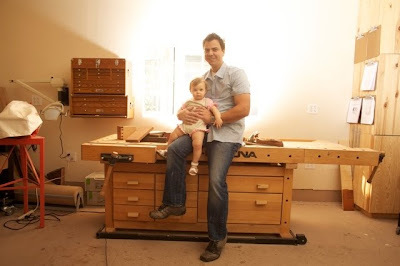 I have long been fascinated with other artisans and those who find a passion in their work. 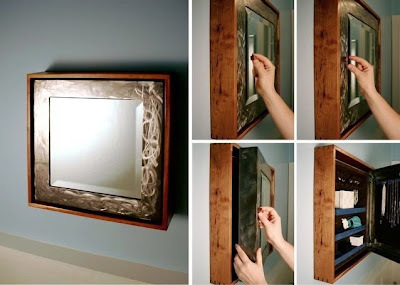 Craftsmanship and artisanal touches lure me, just like this mirror with a magnetic hidden door for hiding the family jewels. Genius design! Take a look at his designs here, would you? 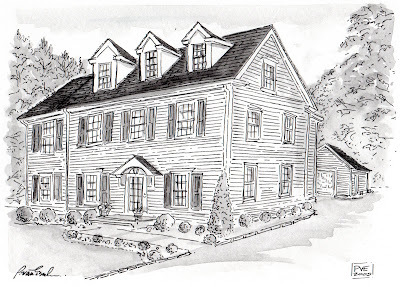 Do you have any room in your home for "Holme's furniture?" I would love a "hope" chest with some cleverly designed hidden compartment. What would you like for Chris Holme to make for you? 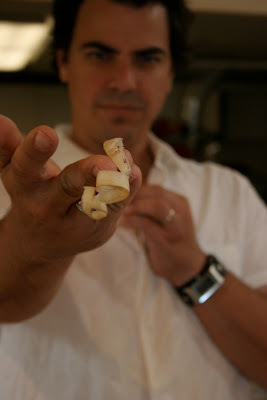 Do you see anything on his site that you would like to take home? 1. Does your blog have a mission statement? 2. Why did you begin your blog? 3. Do you earn money from blogging? 4. How much traffic does your blog get? 5. Do you get comments? 6. Do you blog every day? 7. Does your blog have paid advertisers? 8. What is next for your blog? 10. Do you as a (blogger) have a favorite blog? 11. How many blogs do you read a day? These were the questions that we each had to answer in a casual format, while "passing the microphone" and all answers varied, but each blog is personal and none of us currently earn money from blogging, nor are paid to post our content. Some of us are more motivated by comments or the traffic and some "tweet" - some "not" and most post daily. So you see, blogging is personal and there is no "secret" formula other than finding what works best for you - Most are not "just" bloggers, we all have lives and are human! I look forward to an exciting afternoon and meeting other design minds and will be back to share all about this! 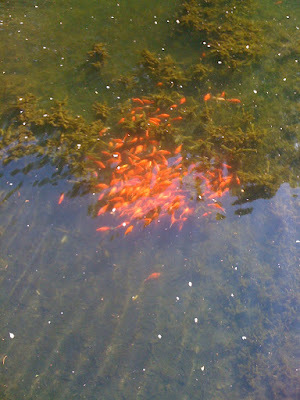 (as well as fish and birds) from the Leigh Yawkey Woodson Museum located in Wausau, Wisconsin. 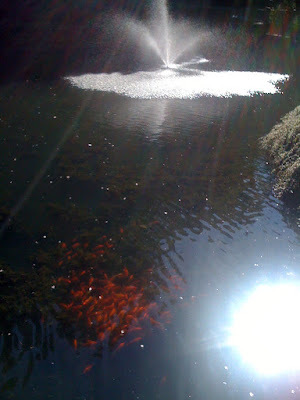 The fountain, the school of fish and the light of the day was utterly fabulous! The visual appeal and aesthetic appeal of water can be found in many interpretive challenges it presents to to artists from the continual movement, the glimmering surfaces that reflect light and the unpredictability of nature. Here is the museum. What a spectacular work of Architecture inside and out. 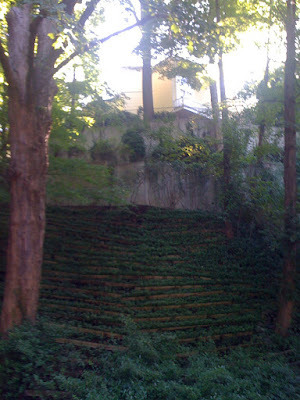 The sheer magnitude of the size of the lanterns as well as the perfectly proportioned ivy thrilled me! I thought so many of you would love this! "Ever Rest" is perched above, situated amongst nature. 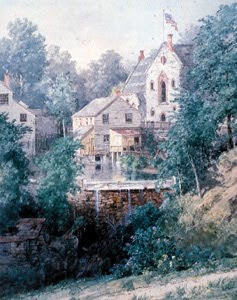 The Hudson River School of Music was all about respecting and reflecting nature. 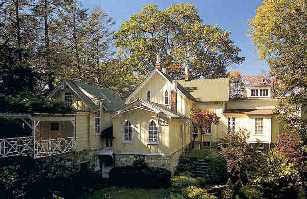 I encourage each of you to visit Newington Cropsey Museum, located in Hastings-on-Hudson. Thank-you Hudson River School Painters for all you inspire. 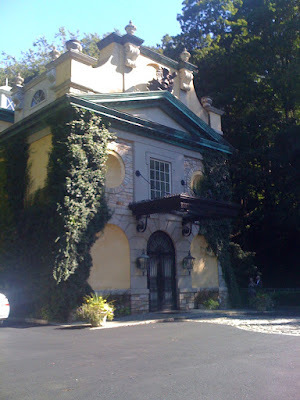 Hudson River School painter Jasper Cropsey, "Artist's residence" named "Ever Rest"
Sunday, I had the great pleasure of attending a reception at the "Newington Cropsey" Art Gallery which is open for special shows or by appointment. It was a gorgeous day inside and out. I will post more this week. Thank-you to Kathleen for the kind invitation. He belongs to Whitney of Edman"s Furniture. Phone: Hi, it's me, Eddie. 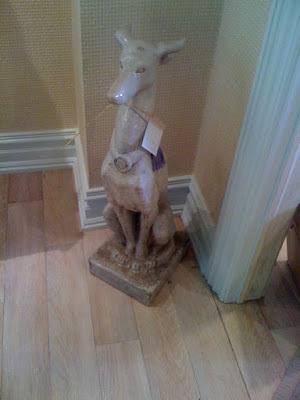 Phone: Laughter and giggling....yes, we were thinking you might want to do this sketch for this room for the Southfield showhouse with us...you know, vintage, found treasures, of all the things we love to make up a fabulous room. Not all over the top, but a beautiful room full of all of our favorite things, and then sketched, loose and big, by you. You know, in your style, we would pay for the paper, the art would be for sale and then 10% of the proceeds would go for the event. How does that sound? Me; (heart in my head) I feel like the time ~ (circa 1992) I was asked if I wanted to fly the Concorde by the guy who worked in travel, and I said "Well, let me think about it" dropped the phone and ran to the travel desk and literally hugged the travel guy and said YES only if you can get the sweater designer to fly next to me. So, that is how I felt, I wanted to drop the phone, get in my car and fly to Eddie and give him a big squishy hug (& Jaithan too) and tell them how thrilled I am. Enough. Yes, Yes, without hesitation. Can someone pinch me now or am I dreaming? Can this really be real? 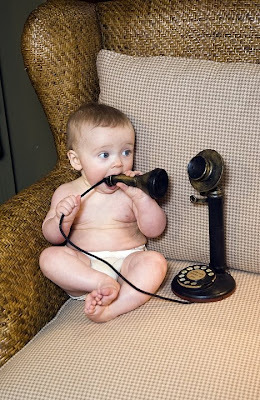 So, if you call, and there is a busy signal, I promise to call you right back! A busy signal seems such a thing of the past. Good morning September. I love Autumn in New York. I find myself falling head over heels for a bunch of orange flowers and bringing home a potted mum or a decorative cabbage makes me smile. Little signs of Autumn make me happy. 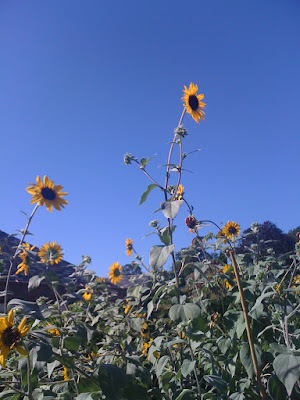 Hope each of you are savoring your September morning. 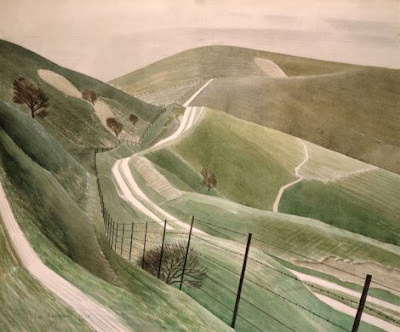 Watercolor "chalkpaths" - work of E.Ravilious, thanks to a Bloomsbury life for the intro. Autumn conjures up images of quilts, stone walls, country fields and a plethora of patchwork. I have to dig a little deeper and find out exactly where this fascination of patchwork began. Could it be my love for classic cozy things with an Anthropologie twist. 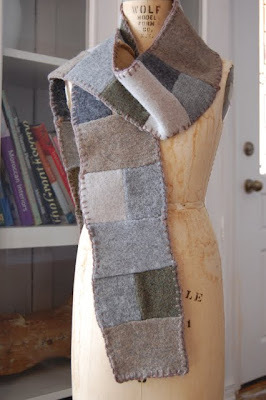 Suddenly, I want to make this patchy scarf from recycled thrift shop sweaters or sew some patches on my jeans...I love this look, how about you? Am I the only one living in a patchy fog or is it me just trying to add a hipness to thy thrifty self? These would make wonderful gifts for the holidays. It could be my farewell to Summer Madras and hello to a Fall Quilt that just went back on my bed for cooler nights to come. Painting allows me to hear a whisper directing my conscience to work toward a place of restraint. The ability to listen, to hold back and to hear what I see, to stop, to look and to listen. Creativity requires one to really "listen from within." When you work, do you listen to that still small voice? Last night we attended the US Open, and it was an exciting evening to see top Tennis played as well as top sportsmanship. The crowd was full of enthusiasm. Congrats to all the athletes. We were able to see the men's wheelchair finals as well the ladies finals. I was so pleased to see Kim, coming back after retirement, adding the duty of motherhood to her role and playing to win number one. It was sweet to see her little one up for the event and the crowd cheering for these ladies! Now, to work on my own game of tennis, they make it look easy, even though we know it takes work to be number one! 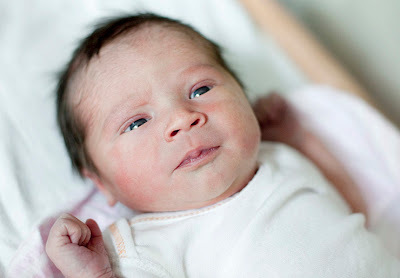 Welcome "Sloane Chancy" baby of (blogger- design goddess) urban grace (Mom Erika) ! and how could we not mention baby-Daddy Chance. 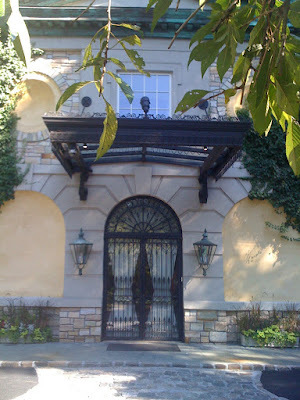 Imagine having a little place to go to for the most scrumptious fare and this charming entrance that will take your breath away as well as the medjool dates stuffed with gorgonzola and topped with bacon. Amy has provided many a fabulous "take-away" meal during ski season - as well as apres ski treats. 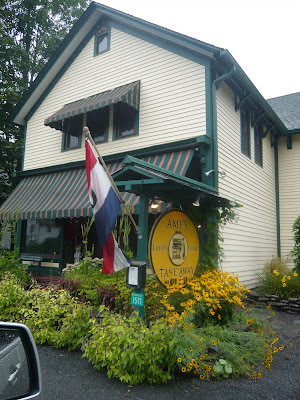 This is one of my favorite spots in the Catskills, "Amy's Take-away" - Amy prepares yummy cuisine with regard for the freshest local ingredients. She has a green thumb too and an infectious smile. We have become friends over the years. Running a small business is a ton of work and I am all for supporting those that are trying to do what they love and make a living. Amy is surely an inspiration to me! I love calling in an order and then anticipating her infusion of taste to everything she makes. Can you see the old vintage stove outside and also on her signage? Inside her kitchen is spotless and her welcoming smile is full of joy. If you are ever in the area, please stop in or call ahead to reserve an order to take-away. I am happy to give you her number. Isn't she a beauty? Yes, indeed she has that grand commanding air about her. Standing there, built to witness a full life. There is indeed something about her grace which speaks volumes to me. A "built" to stand the test of time demeanor. Stately, yet beguiling. Elegant yet humble. Royal yet homey. 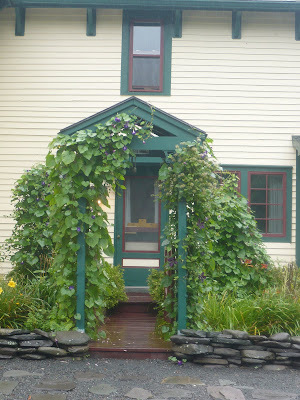 Then that deep Blue- Green trim and front door and the pediment around the entry and lush plantings. I am drawn to one of such a kind soul. Imagine bringing home babies, pets, groceries and more to this kind of home. 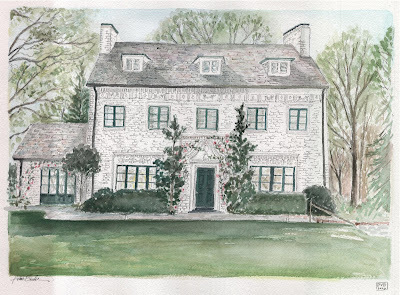 This southern client has lived here for many years so when it came time for a commission, she was patient and charming. I imagined her living up to the quality of this home. Which brings me to the next question, are you the kind of person who matches your home, one who lives up to the character and soul of the home. I often think people fit the home in which they live. The home becomes a reflection of them. 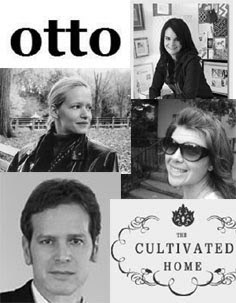 What kind of home do you exude? The years of tending, nurturing, giving, loving, maintaining a home of such a kind takes a quality person, one with integrity and reverence. 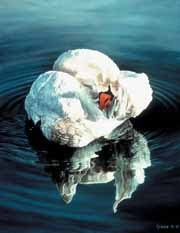 Do you reflect your habitat and does your habitat reflect you? What does you home say about the quality of your life? 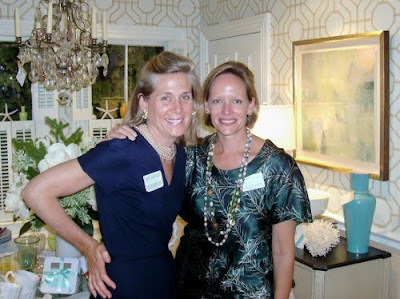 It is with great pleasure that I introduce SM Home, Sandra Morgan Interiors to you. 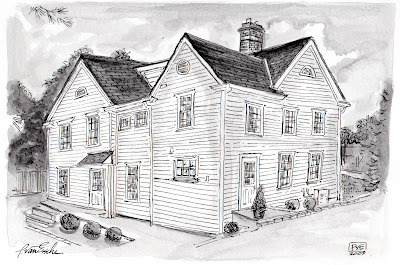 Sandra will represent my artwork in her fabulous shop, located in Greenwich, CT. I will be there creating petite "live" artworks for sale. 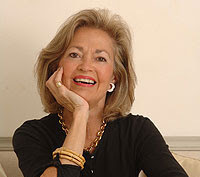 Sandra provides clients with an array of services for Interior Design. 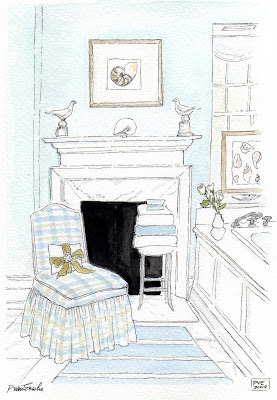 How lovely to come home to a bathroom with a slipper chair, a fluffy stack of fresh towels and even a fire-place. Sandra has a light touch and a penchant for utilizing color and arranging exquisite tasteful objects with a Swedish flair. 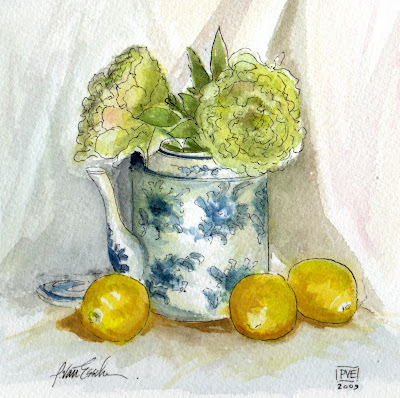 My artwork will be another offering, clients may have custom artwork for their homes, of interiors, homes, objects, pets, and keepsake treasures. Custom framing is available. Please come by, meet Sandra, introduce yourself to me (if we have not had the pleasure of meeting) and have a glass of wine. 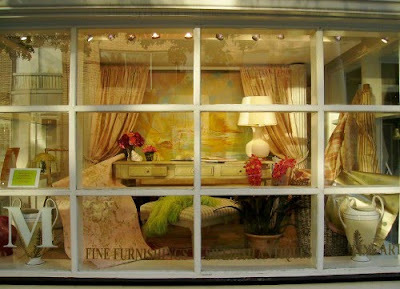 I look forward to meeting you "at home" in the Sandra Morgan Shop located at 70 Arch Street in Greenwich, CT.